Fundamental to the life of every multi-celled organism, hormones are a crucial part of our biology and play a critical role in health and disease. Our largely invisible endocrine system runs and chemically regulates our bodily functions, including growth, development, metabolism, digestion, reproduction, stress reactions and the regulation of other hormones. Each of the numerous identified human hormones, or chemical messengers, have a specific purpose, as they precisely target cells that perform specialized tasks. Endocrines may be tucked away in small corners of the body but hormonal balance plays a huge role in the regulation of physiological processes. Along with the nervous system, which is built for speed and rapid changes, the endocrines, with their long lasting and powerful effects, slowly continue to regulate and exert influence throughout life. When our body chemistry is balanced, hormones help to keep us physically and emotionally healthy. Hormonal imbalance can wreak havoc with our weight, appearance, mood, fertility, energy and stress levels, all symptoms that can adversely affect our quality of life. When hormones are in balance, weight is easier to maintain, moods are more stabilized and energy levels are optimized. Hormonal imbalance can occur at different life stages, such as during puberty, and largely affect men and women approaching middle age. Hormonal dysfunction can be the result of both an overproduction or an underproduction of specific hormones. Hormone production can be altered or affected by aging, genetics, chronic stress, and infections or diseases. Lifestyle factors such as poor diet and lack of exercise, and environmental factors such as exposure to toxins and endocrine disrupting chemicals, can also result in hormone disruptions. If you are suffering from adrenal fatigue or are considering hormone replacement therapy (HRT), which may cause serious health related side effects, you may want to try some of these lifestyle changes first. Improve your diet – There’s a link between diet and hormone health. Avoiding processed foods is a good strategy for preserving natural hormone function. Eliminate chemically altered oils and fats and refined carbohydrates that can elevate estrogen levels. Eat foods that are rich in essential fatty acids and fruits and vegetables high in flavonols, phytonutrients and fiber. Go organic whenever possible. Eliminate toxins – Toxic chemicals, found in pesticides, plastics, household and even body care and beauty products, can contain hormone disrupting chemicals that mimic natural hormones and interfere with hormone production. Try switching to more natural cleansers and products. Cook in glass or non-coated metal pans and store food in glass containers. Improve indoor air quality by adding plants, which help to remove indoor pollutants and purify the air. Reduce stress levels – The adrenals manufacture numerous hormones in addition to stress monitoring hormones. These hormones are involved in blood sugar regulation, mineral regulation, and energy level maintenance. Chronic stress can lead to adrenal exhaustion in which the adrenals can no longer maintain adequate hormone production. This can lead to extreme fatigue, inability to concentrate, insomnia, depression, anxiety and diabetes. Rest and nutrition can help to restore adrenal function. B vitamins, minerals such as magnesium, zinc and potassium, adaptogenic herbs and adrenal extracts can be useful in rebuilding the adrenals. Get adequate sleep – We all skimp on sleep sometimes but sleep is one of the best tips for improving hormone balance. Stress hormones regulate while you are sleeping. Adequate sleep is linked to more optimal weight and improved immune function. Don’t over exercise – Hormones released during exercise are directly proportional to intensity and duration. Keeping exercise short and sweet (30 – 40 minutes) with high intensity and maximum effort is most effective for fat burning and hormonal balance. Try yoga for its stress reducing and hormone enhancing benefits. Yoga practice can lower cortisol levels, reduce adrenalin and stimulate production of GABA, a brain calming chemical. PhytoB-L 4X by Bezwecken – This plant derived formula provides naturally sourced progesterone and estrogens to support a desirable hormonal balance. Hormone Balance #501 by Ness Enzymes – This enzyme and herbal formula provides nutrition based ingredients for hormonal imbalance. Gluten free formula. 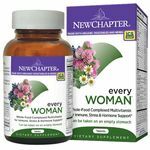 Every Woman by New Chapter – This whole food multivitamin and mineral supplement provides immune, stress and hormone support and is specifically formulated for active women over the age of 40. Organic herbs, probiotics, cultured whole-food and herbal blends work synergistically to promote optimal health and address nutrient deficiencies. Vegetarian, gluten-free, Non-GMO formula. Testron SX by Nutraceutics – This botanical based formula is designed for maximum hormonal support for the active male. Preferred by athletes and fitness enthusiasts, this safe and natural supplement provides broad support for men’s health and is suitable for all men over the age of 18. Adren-All by Ortho Molecular – Formulated with vitamins, minerals and herbal nutrients, this supplement is designed to nutritionally support healthy adrenal function, boost energy levels, and provide a general sense of wellbeing. Gluten and soy free. This entry was posted in Home and tagged Adren-All by Ortho Molecular, Don't over exercise, Eliminate toxins, Every Woman by New Chapter, Get adequate sleep, Hormonal Imbalance, Hormone Balance #501 by Ness Enzymes, Improve your diet, PhytoB-L 4X by Bezwecken, Professional Supplement Center, Reduce stress levels, Testron SX by Nutraceutics, Vitamins and supplements, www.professionalsupplementcenter.com. Bookmark the permalink.